Nourish dry, sensitive skin with the Crabtree & Evelyn Goatmilk & Oat Body Cream; a cashmere-soft treatment rich in deeply nourishing ingredients and natural extracts. 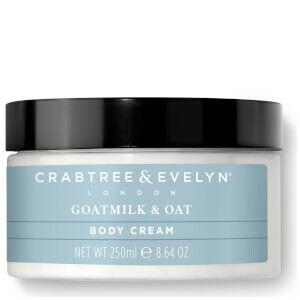 Based upon a Shea Butter formula, it melts into skin to deliver intensive conditioning with a proprietary blend of free-range Goat’s Milk and Oat Kernel offering soothing properties to leave skin feeling comfortable and replenished. Apply generously on extremely dry patches for targeted results. Massage into skin with circular strokes. To restore areas of extreme dryness, start with a more generous helping of cream and work in slowly.